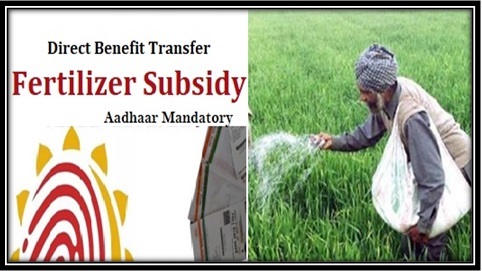 Modi Government has announced the implementation of fast track system for instant processing of subsidy payment that is to be made for fertilizers to the farmers. With the implementation it is certain that farmers can avail direct benefit for processing of their subsidy payments made against fertilizer purchase. Under the DBT system, it is certain that the disbursement of the budget amount will be done evenly for fertilizer subsidy amongst different companies for the fertilizer purchase for different farmers. By monitoring PoS it is certain that the government will be able to keep a track of al purchase and sales made. This will be possible once the PoS have been installed in various districts. Presently the government has ensured that over 2 lakh points of retailers have been set up at various locations in the country that shall be tracked by the government officials. This certainly will offer with additional advantage as compared to the present system that is more based on subsidy receipt from the godown or various Railhead points in the districts. With the new implementation the main aim of the government is to regulate the subsidy leakage to benefit the farmers that they have to face when there is no sales made. Apart from this it is certain that with the new implementation the government also aims at transforming the transaction between fertilizer companies and farmers to make it digital and speed up the process. As the implementation is made it is certain that the government can also check with how many farmers are purchasing the fertilizer and in what quantity are they purchasing. As the scheme is aimed at offering full benefit of subsidy to the farmers so it is certain that to get the full benefit one has to be farmer and the owner of the agricultural land. Under the scheme all manufacturers are eligible to register who manufacture fertilizer both of organic and inorganic type. Any retailer who deals in selling fertilizer products to the farmer and is registered retailer is also valid to get registered under the scheme for taking its benefit. In order to get registered under the scheme it is certain that the farmers have to provide with a copy of their owned land, if any. This related to the documents that can prove the ownership of the farmer for his land. The farmer will also have to provide with a copy of his valid Aadhar card as the PoS machine will be extracting all data regarding the farmer directly from his Aadhar card. The retailer who is registered also has to provide with all documents along with the receipt that is issued to the farmer that mentions the product that the farmer has purchased. The retailer should also provide with a copy of the stock book in which he maintains the complete record of his closing and opening stocks annually. The moment the DBT system is implemented farmers will be eligible to get their subsidy instantly for every purchase of fertilizer they make. This is applicable if the purchase has been made from registered retailer. On making the purchase the government will be able to track each transaction after the implementation of the DBT system. The subsidy amount will directly be reimbursed back to the manufacturer under the new system within one or two days from the date of purchase made. “Subsidies to Farmers under Various Government Schemes have been launched by government for the help of poor farmers.” You can read here “Schemes of Central”. The government was expected to implement the new DBT system nationwide by 1st October 2017 but due to shortage of PoS machines it is certain that the project was delayed. The government has also ensured that a similar Pilot project has been running parallel in over 14 districts and it is certain that by April 1st 2018 the government expects to extend this project nationwide. After the implementation it is certain that the government aims at linking over 14 crore farmers nationwide with the DBT system and iFMS system. Later on the government plans at linking the DBT system with all available retailers data so a digital record can be maintained for each of the transaction made. To calculate the state wise subsidy on fertilizer the government computed fertilizer subsidy on per unit basis. This was done for unregulated fertilizers both K and P type. Then this unit is divided by the overall concession that is paid for purchasing these two types of fertilizers by the overall consumption of both types in the next following year. The unit is then multiplied with the actual consumption of both K and P type fertilizer for any particular state. This will provide with details of fertilizer distribution as compared to the subsidy provided. It is certain that the DBT system has been introduced by the government so the data of purchase of subsidized fertilizer can be maintained and recorded for speeding up the process of reimbursement. After the implementation of the DBT system the government will be able to ensure that the genuine farmer is getting the benefit of the subsidized fertilizer purchase. For the farmers it is certain that with the rolling out of the DBT system all their transactions will be easily recorded and maintained in the PoS system. Retailers will have to upload a complete data of their sales and purchases made under the new system before it can be integrated. This is important if the manufacturers want to claim their reimbursement of the subsidy amount. Presently to ease the process of reimbursement of the subsidy amount for manufacturers the government is taking every step to ensure that the PoS are installed at the earliest and all data uploaded by the retailers. It is certain that the government has already announced the set budget of Rs 70,000 crore for the fiscal year 2017-18 for fertilizer subsidy and over 2 lakh retail points across the country.